Page numbers if the shipping paper has more than one page. The first page must tell the total number of pages. (e.g., Page 1 of 4). A proper shipping description for each hazardous material. A shipperʼs certification, signed by the shipper , saying the shipment was prepared according to the rules. Identified by an “X” placed before the shipping name in a column captioned “HM.” The letters “RQ” may be used instead of “X” if a reportable quantity is present in one package. The basic shipping description of a hazardous material on a shipping paper must include the (1) identification number (preceded by the letters UN or NA); (2) DOT proper shipping name; (3) hazardous class or division number of a product (must include subsidiary hazard class when required); and (4) packing group for a product in a roman numeric pattern (may precede with the letters PG). The number and type of packages must be indicated. The letters RQ, if a reportable quantity. If the letters RQ appear, the name of the hazardous substance. For “not otherwise specified” and generic descriptions, the technical name of the hazardous material. Shipping papers also must list an emergency response telephone number. The emergency response telephone number is the responsibility of the shipper. It can be used by emergency responders to obtain information about any hazardous materials involved in a spill or fire. Shippers also must provide emergency response information to the motor carrier for each hazardous material being shipped. The emergency response information must be able to be used away from the motor vehicle and must provide information on how to safely handle incidents involving the material. It must include information on the shipping name of the hazardous materials, risks to health, fire, explosion, and initial methods of handling spills, fires and leaks of the materials. Such information can be on the shipping paper or some other document that includes the basic description and technical name of the hazardous material. Or, it may be in a guidance book such as the Emergency Response Guidebook (ERG). Motor carriers may assist shippers by keeping an ERG on each vehicle carrying hazardous materials. 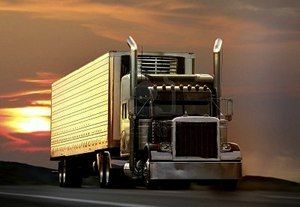 The driver must provide the emergency response information to any federal, state or local authority responding to a hazardous materials incident or investigating one. Total quantity and the number and type of packages must appear before or after the basic description The packaging type and unit of measurement may be abbreviated. Example: 10 ctns. UN1263, Paint, 3, PG II, 500 lbs. A non-hazardous material may not be described by using a hazard class or an ID number. Make sure you memorize the list below, showing what must be included on a shipping paper. We will see the "Shipper's Certification" mentioned many times in the next few pages. 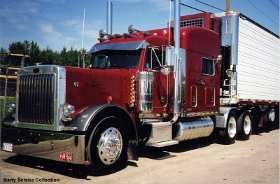 Questions about the shippers certification are fairly common on the written exam. Once again, the below list should be memorized. 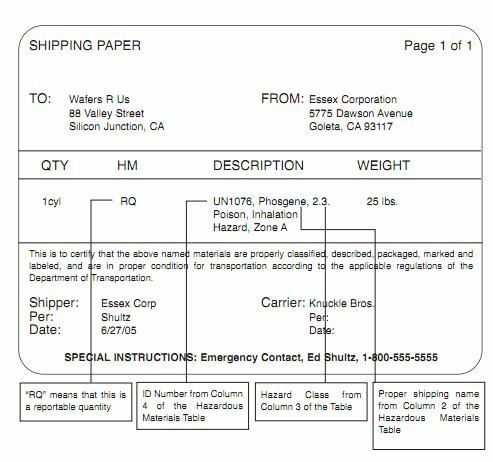 You must know how to identify hazardous materials on a shipping paper and also be able to verify the information the shipper provides you with is legal and correct. This frequently shows up on the written exam. Remember: It is the shipper's responsibility to provide the driver with an emergency response telephone number, which must be located on the shipping paper. Initial methods of handling spills, fires and leaks of the materials. While it is solely the shippers responsibility to provide you with proper shipping papers, you must be certain all shipping papers are correct before leaving their facility. If there are any issues with the paperwork along your trip (DOT inspections, etc) it will cost you time and you can possibly be ticketed. Which hazardous materials description below is correct? Identified by an "X" placed before the shipping name in a column captioned "HM"
Identified by an "X" placed before the shipping name in a column captioned "HM." The letters "RQ" may be used instead of "X" if a reportable quantity is present in one package. Page numbers if the shipping paper has more than one page. The first page must tell the total number of pages (e.g., Page 1 of 4). A shipper's certification, signed by the shipper, saying the shipment was prepared according to the rules. It is very rare for shippers to use anything other than the letters "UN" for hazardous materials identification numbers. Total quantity and the number and type of packages must appear before or after the basic description. The packaging type and unit of measurement may be abbreviated. Example: 10 ctns. UN1263, Paint, 3, PG II, 500 lbs. Signed by the driver, saying the shipment was prepared according to the rules. Signed by the shipper, saying the shipment was prepared according to the rules. Which of the following must be included on hazardous materials shipping papers? What is the primary reason for an emergency response telephone number? Who must provide emergency response information to the motor carrier for each Hazardous material being shipped?